The content of the Hub is designed to be informative and exciting; the new audio post provides engaging audio information and the visitor counter provides our Tourism Team with useful visitor and usage information. Maldon District Council have recently been working on a visitor hub project about the Saltmarsh Coast. Four of the hubs have been unveiled at Heybridge Basin, Bradwell-on-Sea, Burnham-on-Crouch and Tollesbury and represent a significant part of the Dengie Gateway project the council has been working on. The gateway project has been designed to make Maldon District a better place for people to work and enjoy living. As part of the visitor hubs, five of our oak Solar Audio Posts have been supplied. They were chosen specifically for their self powered nature and ability to work in all kinds of weather. The audio posts are situated by accompanying signage displaying information about each area in the Saltmarsh Coast. 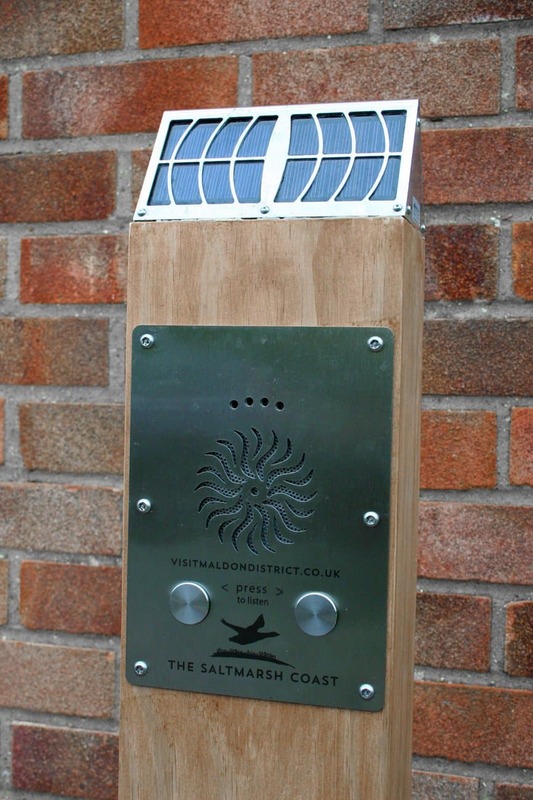 The audio on the solar post shares information about the Saltmarsh Coast in relation to its location and allows visitors to engage with the local area in a fun and interactive manner. The project has allowed the Council to celebrate everything the district has to offer, helping visitors discover more about the Saltmarsh Coast through engaging and environmentally friendly audio interpretation.